Baroness Julia Cumberlege was the special guest at the L&D’s first Maternity Open Day on Thursday 13 July and also cut the ribbon at the official opening of the new birthing pool. 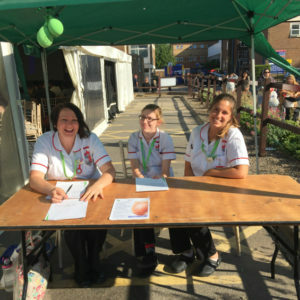 The Maternity And Mothers Meeting dAy (MAMMA) event, which focused on ‘What Women Want’, was held in a marquee on the hospital site and was an opportunity for local families, parents, and parents-to-be to come and meet staff and hear more about the services we offer. Local GPs, health visitors and commissioners and other professionals were also invited to come along and meet the team. Before the start of the event, Baroness Cumberlege and Trust Chairman Simon Linnett visited the Maternity unit to officially open the new birthing pool, and to meet staff and families on the postnatal ward. She then went on to give the keynote speech at the MAMMA event when she talked about ‘Better Births’. Other speakers included Consultant Midwife Stella Roberts and Angharad Ruttley, who talked about her own experience of giving birth at the L&D. There were also presentations by consultants Jacqueline Bamfo, Beryl Adler and Angus Rivers, who discussed obstetric, neonatal and anaesthetic services. Guests were also invited to name the Maternity unit’s new kangaroo mascot.